It wasn’t without some nerves that I approached the date of the move, it was by far the longest I had done in Gee N Tee in one trip and would also be the longest time I would have been out on the water in her. The day got closer and closer and I started watching the weather like an expectant father, due to a last minute change it meant I also might have to do the trip on my own, another massive first in my mind although something that I wasn’t too worried about as long as I could get away from the pontoon in Northney I would have mooring assistance in Brighton. Ok so the logistics of sailing down the coast and then getting back to wherever you wanted to be were not lost on me, so I had loaded the motorbike into the back of the van and taken this to Brighton the night before, dropping it off at the Marina, then collecting my crew (at who’s house I had spent the night) and travelling the distance back to Northney in the van, the next day, all being well I would ride back and collect the van. The weather when we arrived at Northney, not a bad time for me as I am not a morning person and 08.30 to be casting off was pretty impressive, was about the best we could have hoped for. 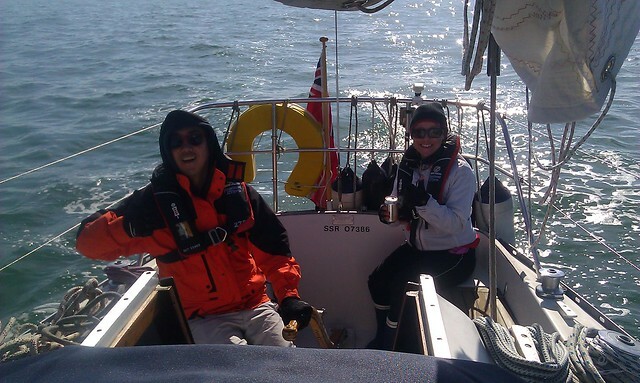 Gemma was in the middle of her day skippercourses and had been on her competent crew when I was doing my day skipper so I knew she would be able to help with maneuvers, her partner Johnny was on his first sailing trip. We set off and almost immediately came to grief, Gemma had sorted out the slip on the bow and that end was all well, I had done the same on the stern but when I let go the line it had some how managed to snake under a cleat and jam, before I knew it the stern was swinging back to the pontoon. It may have been the fact that I hadn’t been out for a while but i had been swinging her out the wrong way anyway. Gee N Tee had helped me by bringing her stern back in, I quickly flicked the line off again and this time moving in the right direction, performing a lovely reverse to starboard and at the same time calming asked Johnny to pull the line in. After that we motored cleanly out of the marina and headed down the Emsworth channel, passing a lot of the familiar sights that I was used to seeing on every trip that we had done in the last year. It was great to be back on the water and my nerves eased off gradually until I really started to enjoy myself. As usual we were head to wind all the way through Chichester harbor and with over 40 nautical miles to go I didn’t really want get off the motor until we got clear of the bar. Johnny and Gemma appeared to be enjoying themselves even though they were both suffering slightly from a night out. As we got level with Hayling Island Sailing Club the swell started to bounce us about, by the time we got past the bar we were smashing into the waves, the little Yanmar engine struggling to give us any speed at all. Finally we made it clear of the West Pole beacon and turn to port, getting the sails up and really smoothing off the ride, Johnny was already feeling a bit queasy and it was long before Gemma was turning green and I was holding onto the tiller with the belief that it would make everything feel better. It was when we were starting to all feel rough that we had the second scare of the day.